Mental illness is one of the most painful and difficult things a person can experience. The crippling anxiety attacks, low moods, depression, fatigue, loss of sleep and a multitude of other symptoms. Added on top of the physical and emotional symptoms is the isolation that can make you feel like a prisoner of your own thoughts. People often choose to remain alone in their torment. In this article we shall look at the reasons people choose not to speak out as well as the benefits of doing so. Why do people not speak out? Fear of rejection- One reason people don’t reach out is the fear that others won’t understand or accept them. There is so much ignorance and stigma surrounding mental illness that you might feel that it is in your best interests to not say anything and blend in to the crowd. This creates social isolation which heightens the negative emotions that you are experiencing as well as compounds feelings of low self worth. Confusion- When experiencing difficult emotions people can disconnect with their feelings. This is a defense mechanism to protect themselves from pain. If this sounds like you, you may find that your relationships regularly fail and you will most likely have a pattern of ending up in toxic relationships. This is because relationships need honesty and a mutual connection to work and remain healthy. If you have a lack of awareness of what is going on for you, you will be unable to successfully share your emotions and hold your boundaries. It is important to begin reconnecting with your feelings to be able to move forward in your relationships. Not having the words- You might know that you are feeling something but don’t have the words to describes your sensations. If this sounds like you then you possibly were not encouraged to experience emotions whilst growing up. You might be familiar with sayings such as “Boys don’t cry” or “Nobody likes a show off”. Emotions like sad or happy are quite easy emotions to recognize however if your not regularly connecting with your feelings, emotions such as disgust or angst can be much harder to define. All of the above are symptoms of not being able to communicate successfully and not having the tools to be emotionally honest. Emotions need to move and we know this because the clue is in the name…e-MOTION. When you speak about your feelings you are releasing the power that they hold over you in a healthy and controlled way. If you decide not to talk about them then you can be assured that they WILL find another way out, often in a sideways behaviour such as passive aggression. Self awareness is needed for you to be able to open up and connect with those around you. Emotions are very useful things when used right. They are your brain’s way of sending signals to your body to prepare it to take action. There is a direct link between your feelings and your actions. By learning your emotional and behavioral patterns you grow in awareness of what your body needs when feelings arise. I think I am feeling anxious. When anxious I have a dry throat and butterflies in my belly. When I feel like this I often go quiet or isolate. When you know this then you are able to choose to take a different, more healthy action which let’s you move away from unhealthy behaviours. I think I am feeling anxious. When I am anxious I have a dry throat and butterflies in my belly. Instead of isolating, when I feel like this I am going to practice deep breathing. 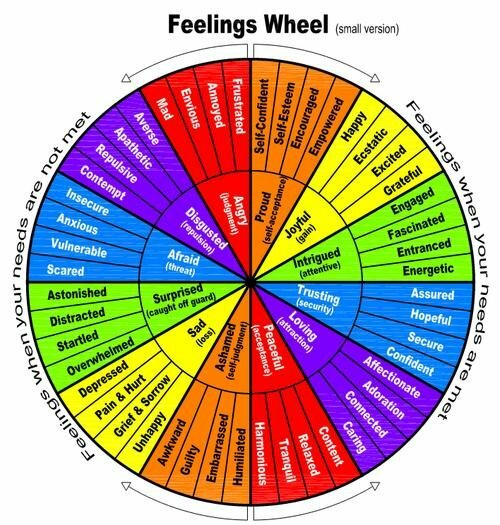 Use the feelings wheel below to help you with this process. Communication is a key skill to learn to help alleviate the pressure mental health issues present. Sometimes though, you are going to be faced with ignorance from other people. It is important in these times to hold your head up high and distance yourself from that negativity. Remember that you can’t argue with stupid. If you find yourself in this unfortunate situation then remind yourself that you are not the issue. Choose to walk away and surround yourself with those positive people who encourage, support and love you. You are not a victim of your mental health. We all have the power to create ourselves a safe and happy world around us. We all have the strength to pick ourselves up and choose to walk along a new path.